Managed Services (MSP) from Net Works Inc. are a Proactive Approach to computer support bundled with additional IT services, into a flat fee monthly pricing structure. We have 4 plans to fit your business needs. 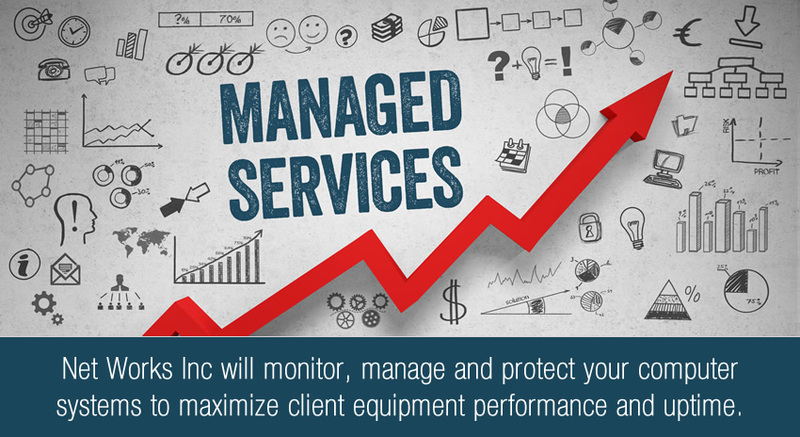 We can provide IT management services that keep your systems running optimally and consistently. Our technicians will monitor & maintain your systems and actively work to prevent technology system failures. jobs. Our IT support plan customers run more efficiently and with greatly reduced system downtime. This helps them not only perform better but also increase ROI and experience greater profitability. Network Monitoring – Ensures your infrastructure is performing optimally and alerts us to any errors immediately. User Help Desk – Support your users by giving them the ability to solve problems quickly. Our Help Desk technicians are knowledgeable and ready to help keep your team productive. Preventative Maintenance – By performing regular, routine maintenance such as daily health checks, patch management, software updates, backup verifications, and anti-virus update checks, we keep your infrastructure running at its best. Customer Involvement – We meet with each of our customers to discuss status and provide recommendations and give businesses a high-level oversight of their infrastructure. Additionally, each month we provide a service summary report to keep you informed of your network health.